We went on our first adventure! 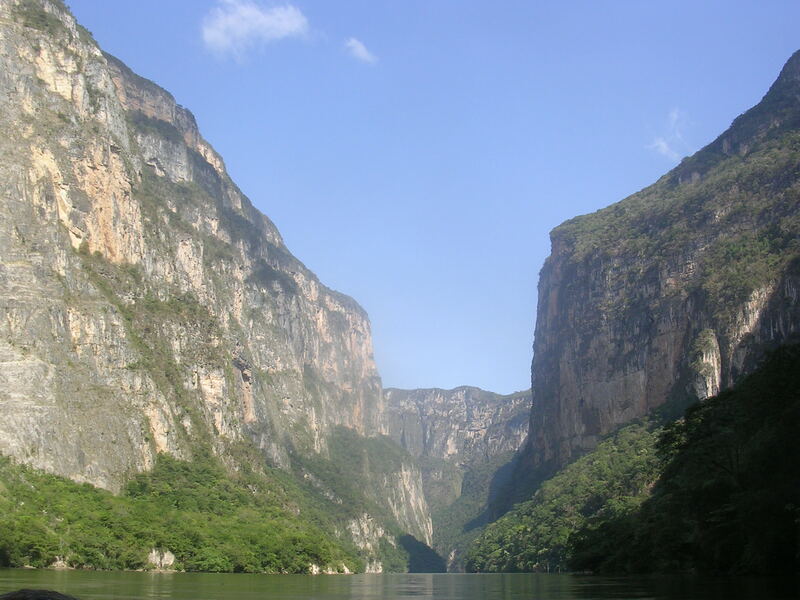 An eco-tour to the Canyon ‘Sumidero’ (Canon del Sumidero). The canyon walls are over 1000 metres in places! 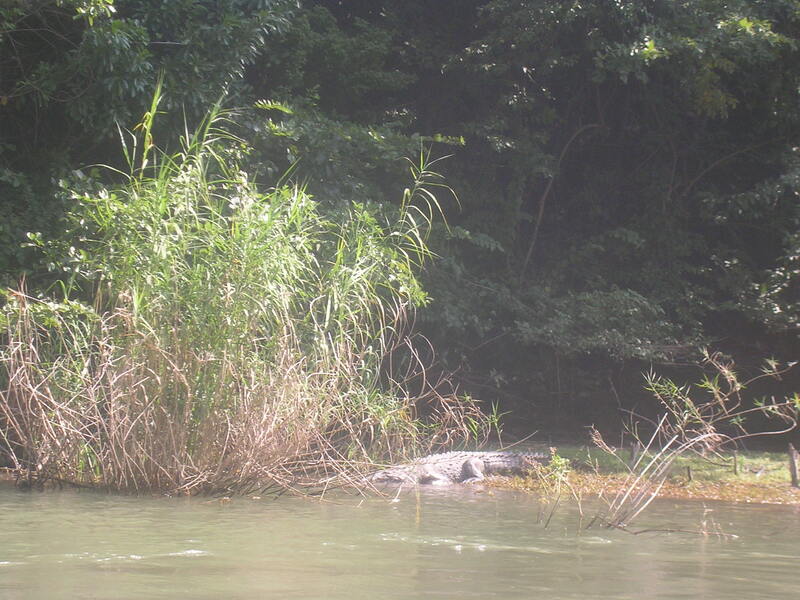 We saw 5 crocodiles! I always dreamed of seeing them in their natural habitat and today that dream came true. I even spotted one that no one else saw. Thank God for laser surgery :). We saw a humungous iguana sunning itself on top of a leafy branch stretched over the river and numerous blue herons and a lot of carrion eaters – a variety of vulture. The people that live near call them the official river cleanup crew. The canyon is incredible. It was nominated in 2009 as one of the 7 new natural wonders of the world. There is this unbelievable ‘Christmas tree’ formation made of rock, fungus, flower, plants and magic. 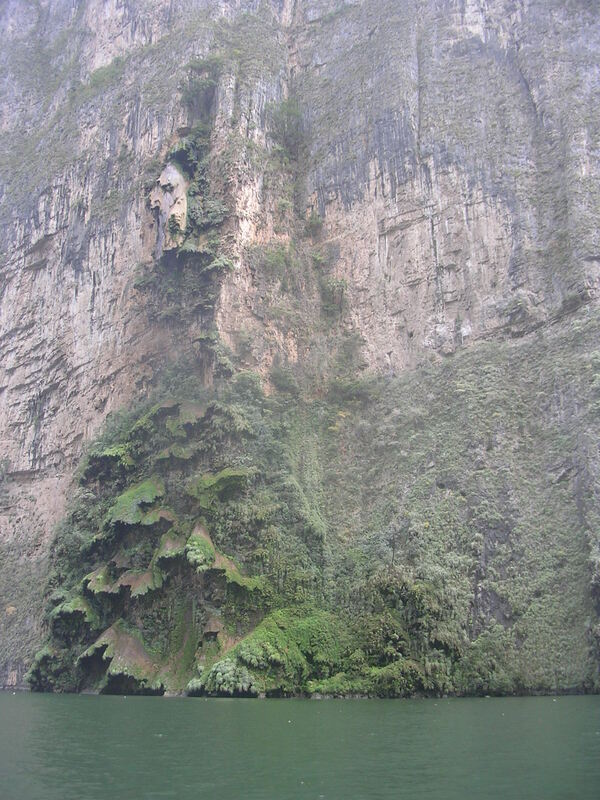 It hangs off the the walls of the canyon and fine water sprays over it all . It was like something from another planet. So cool! The river that we were on is damned and the power plant supplies 25% of Mexico’s power, as well as a big part of Guatemala’s power needs. We went 35 kilometres in a boat with about 8 other people. Everyone was in awe. The sad thing is that this river is 750 km long and passes through some big cities and accumulates a lot of garbage – mostly plastic bottles. They are constantly cleaning it but can’t keep up with it all. But feeling the clean moist air on our faces made up for the dirty spots. We were only there for an hour so we quickly jumped in a taxi and went to a nearby archaeological site. It is where they found the oldest tomb in Mexico- and in the midde of Mayan country – it had a burial mask of an Olmeca! With 3000 jade stones and many other gem stones as well. I’ll have to research where they took the treasures to, it would be very interesting to see them. They found the oldest example of hieroglyphics inMesoamerica at this site as well. A wonderful day – our faces hurt from smiling so much!